Raven Audio Soniquil cables produce a more precise soundstage, higher-definition bass, and sweeter treble than any other cables we have ever experienced. By combining an extremely high build quality, a beautiful looking design and an unbeatable price, there is no better cable to ensure your Raven Audio tube amp or loudspeaker is performing at its very best. You owe it to yourself to audition this cable! Soniquil speaker cables utilize 4 individual, 18 gauge solid-core wires per conductor. Our design includes all the benefits of solid core wire without the lack of flexibility. In fact they are extremely flexible. Our wire design offers conductance equivalent to 12 gauge solid core wire and even greater than 12 gauge stranded wire. Rhodium-plated brass connectors expertly soldered to a high-grade 99.99% oxygen-free copper wire is an essential feature of Raven’s Soniquil cables. Audio engineers know that low resistance is an extremely important factor in delivering an unaltered signal from one component to another. Our cables were designed with this in mind and boy do they deliver. Electromagnetic Interference is an enemy of power supplies in audio equipment. 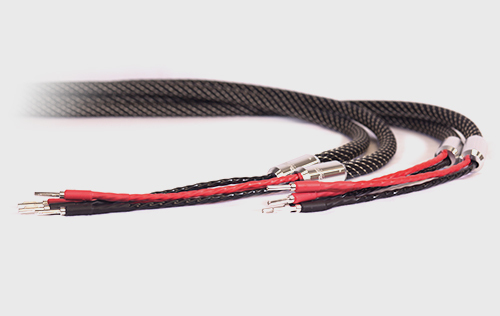 Through well thought out engineering and the use of proper materials, Raven’s Soniquil speaker cables are well shielded and highly resistant to EMI.